For many road trippers, following historic US Route 66 – which ran about 2,000 miles between Chicago and Los Angeles before being supplanted by the interstate highway system – is the holy grail of American road trips. But it can be difficult to recapture the spirit of travel along this historic route. Large sections of the original roadway were incorporated into the modern interstate highway and retain little of their original flavor. In other places, the original road was simply abandoned and, where it is accessible at all, now requires a 4×4 vehicle and a really good map. However, there are stretches of old Route 66 where you can recapture the spirit of its tourist heyday in the 1950s – 1960s. Some are deteriorating rural segments through big, empty-feeling landscapes. Others are hardy towns where the freeway exit leads to a commercial strip out of an old movie. Tucumcari, New Mexico, is among the latter. 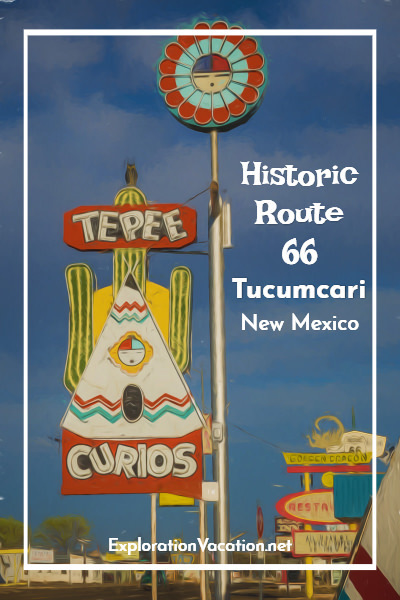 As the largest city between Amarillo, Texas, and Albuquerque, New Mexico, Tucumcari was a popular stop for travelers on old Route 66. With an exit off the interstate highway and the location of the Quay County, New Mexico, county courthouse, Tucumcari was never likely to vanish from the map when I-40 replaced Route 66. However, the downtown business district has always been several blocks off the Route 66 commercial strip. So, while the town continued on after I-40 came through, the businesses along historic Route 66 fell began to decline. Fortunately, the historic commercial strip was never fully abandoned or destroyed. Today there are plenty of ruins along Route 66 in Tucumcari, but many buildings remain and a few have been fully restored to kitschy mid-century splendor. That makes Tucumcari, New Mexico, a great spot to step back in time along the original Route 66. Back when roads were narrow and travel was slower, Tucumcari was pretty far from anywhere else. That made it a popular stop along Route 66. With the interstate, Tucumcari no longer seems quite so isolated, but it is still a great place to spend the night. That’s ensured the survival of a number of historic motels. 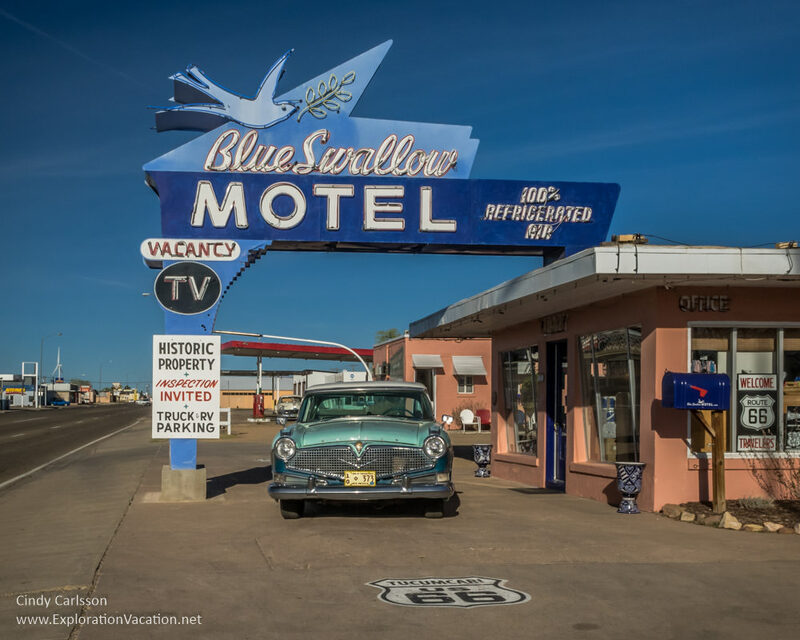 Perhaps the most famous Route 66 motel in Tucumcari, the Blue Swallow opened in 1940 and has remained in business pretty much ever since. An extensive modernization in the 1990s brought the motel’s essential systems up to date. Additional rooms were also added by turning what had been garages between each room (cars needed a cozy place to spend the night too) into space for people. (Cars spend the night outside these days). Despite these changes, the motel looks very much like it did when it first opened – but it’s probably a lot more comfortable! 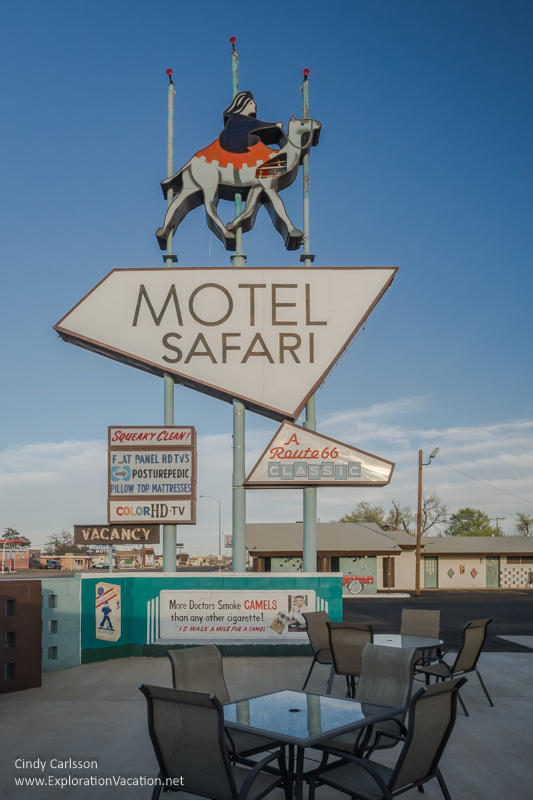 Motel Safari is another Tucumcari classic that’s been brought into the modern era. Built in 1959, the Safari features a western version of the cheerful Doo Wop (Goggie) architecture that Wildwood, New Jersey is famous for. Inside, rooms feature mid-century modern furniture that was custom-built as part of the motel’s construction. And that odd name and sign? Well, a safari is a long journey, so that’s appropriate for a highway motel. And camels were imported to the area and used to survey some of the earliest routes through in the area – including trails that eventually became Route 66. From the outside the Roadrunner Lodge looks like a pretty ordinary 1960s motel. But step inside one of the remodeled 1960s swank rooms and suddenly it is 1964 – but with a better beds and plenty of unobtrusive modern features! The original building was built in 1947 as La Plaza Court. Like the Blue Swallow, it too had garages tucked between the units. But most of the building was constructed in 1964 and operated as Leatherwood Manor. When the two were combined into one property, the roof of the Leatherwood was extended to incorporate the older motel. The motel was closed for 5 years before the current owners bought it – and it was in bad shape. It’s slowly being restored, with rooms beautifully furnished to channel 1960s swank. Expect to find a lot of great vintage furnishings and décor mixed in with replicas. There’s even period appropriate music. The Historic Route 66 Hotel (built in 1963) looks like it would be lovely and its original coffee shop is still in business. It’s a little farther out from most of the other hotels, but still an easy walk to the main part of the Route 66 strip. All rooms are built around a courtyard and have fabulous floor to ceiling windows. This one is not like the others, as the Palomino Motel is still in need of restoration. While this 1953 motel is open, it’s not in good shape. Hopefully that will change, as a new owner plans to upgrade and restore the dilapidated property. But, until then, it’s worth a stop only to admire the remaining 1960s era sign. The Palomino is one of a number of historic motels that offer budget accommodations in historic buildings that are generally in dire need of updating. But at least they are still making a go of it. The passage of time has been hard on a lot of classic Route 66 motels. Even with the number of historic motels that are still in business, Tucumcari has a fair number of quietly decaying properties. If anyone is looking for a remodeling project along historic Route 66, there seem to be some opportunities in Tucumcari. But, don’t wait – they won’t be here forever. For example, the Pony Soldier Motel was demolished in 2010. However, its sign was still standing when I passed through Tucumcari in 2014. A year later the sign was removed and put into storage. More recently, the beautifully restored sign at the long-abandoned Paradise Motel was removed after the buildings were hit (twice) by fire. I didn’t get a picture of the motel or its sign while we were in the area and now I never will. It seems likely the remains of the motel will be demolished while the sign disappears into a private collection. Travelers along Route 66 also needed a place to get a bite to eat. That’s as true today as it was in the past, but not very many of the old restaurants remain. Of those still around, La Cita (opened in 1940, but only in this location since 1961), Del’s (1956), and Golden Dragon (changed to a Chinese restaurant in 1966) are all easy to spot. There are a couple more historic restaurants, including Kix on 66 (located in an old Denny’s) and the Pow Wow Restaurant and Lizard Lounge, but the list is pretty short. Restaurants tend to come and go a lot faster than motels, so there isn’t much old restaurant signage around town either. 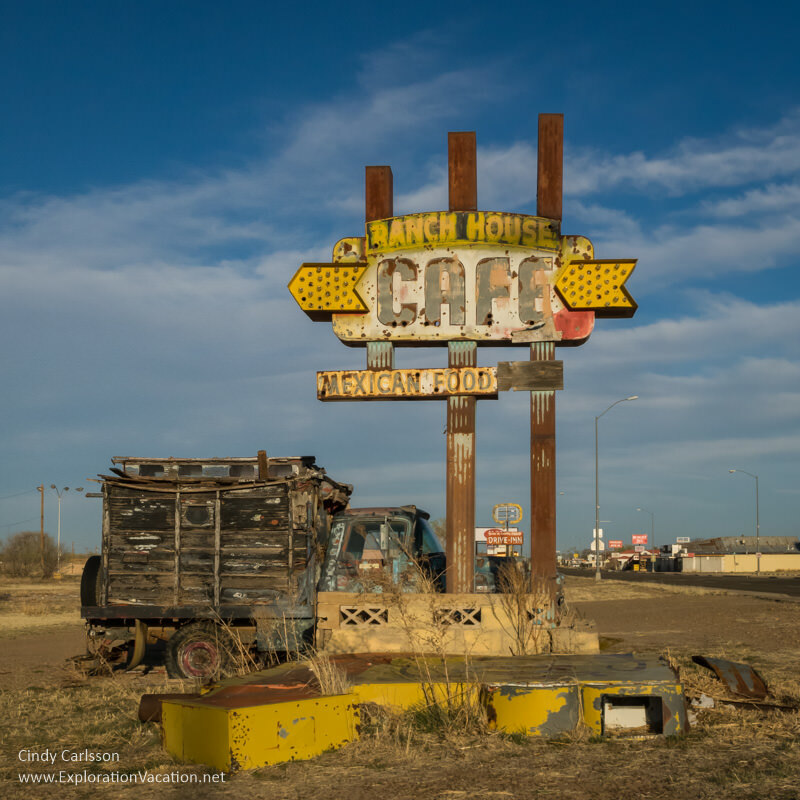 The most notable is probably the huge rusting ruin that once advertised the minuscule Ranch House Café. Sadly, there’s not much left of either the sign or the building these days. 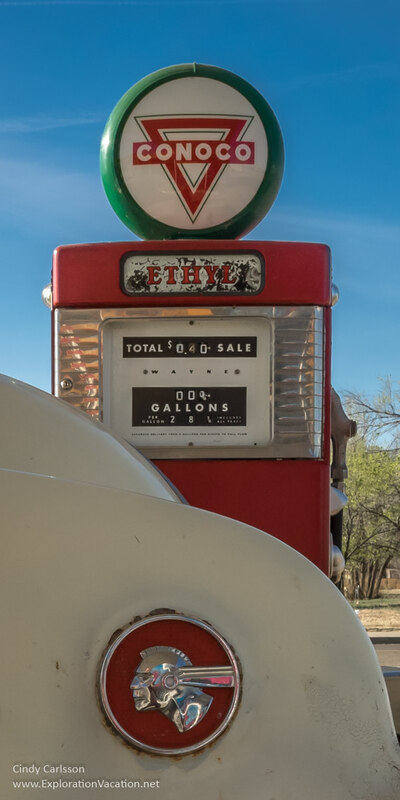 Service stations were once plentiful in Tucumcari. Back in the day, automobiles were more likely to break-down during a road trip. They also consumed a lot more fuel. To make sure neither of those brought a trip to a halt, gas stations and repair shops popped up all along Route 66. And, since Tucumcari wasn’t particularly close to anywhere else, service stations were likely a particularly good business here. Today a few large gas stations along the interstate have replaced all those little local stations. However, many of their buildings are still in use. In Tucumcari some still serve as repair shops for motor vehicles, motorcycles, and equipment of all kinds. However, many others are used as offices and gift shops. Oddly, very few of the buildings currently painted with the name of a particular brand were originally associated with that brand. Every road tripper on Route 66 needed a few souvenirs to commemorate their travels or bring home as gifts. People haven’t quit buying souvenirs, but many of the once ubiquitous souvenir shops have been replaced by antique stores or more up-scale gift shops. Still, a few classic souvenir shops remain. 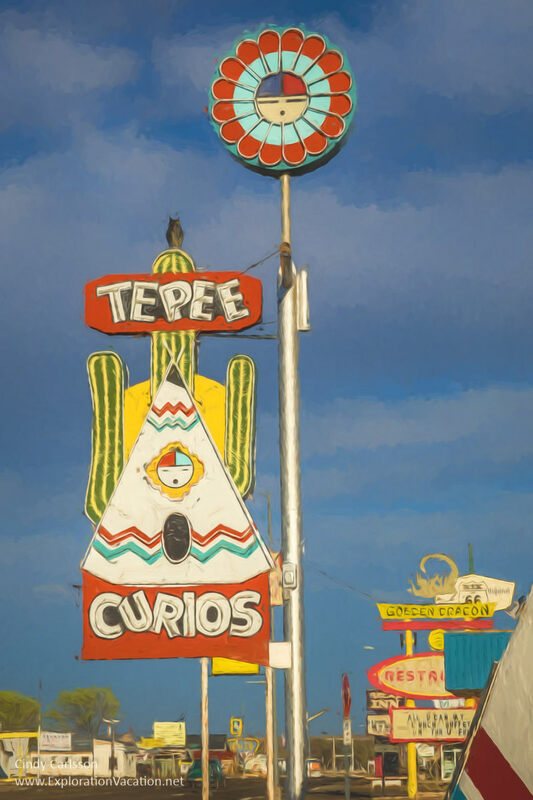 In Tucumcari, the most notable is Tee Pee Curios. 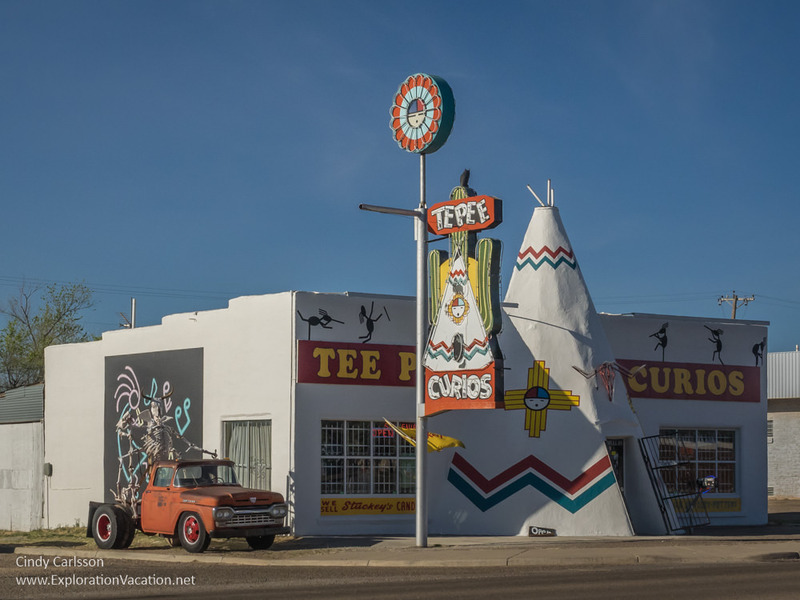 Tee Pee Curios began as a typical combination gas station, grocery store, and souvenir shop in 1944. The sign apparently dates back to the late 40s. The teepee entrance came later, after the gas pumps were removed to accommodate a wider highway. Tucumcari is also home to the New Mexico Route 66 Museum. The museum is located in the city’s convention center and features a large photography exhibit, memorabilia, and a lot of classic cars. Outside, Tom Coffin’s Route 66 Monument celebrates mid-century car culture on the historic highway. 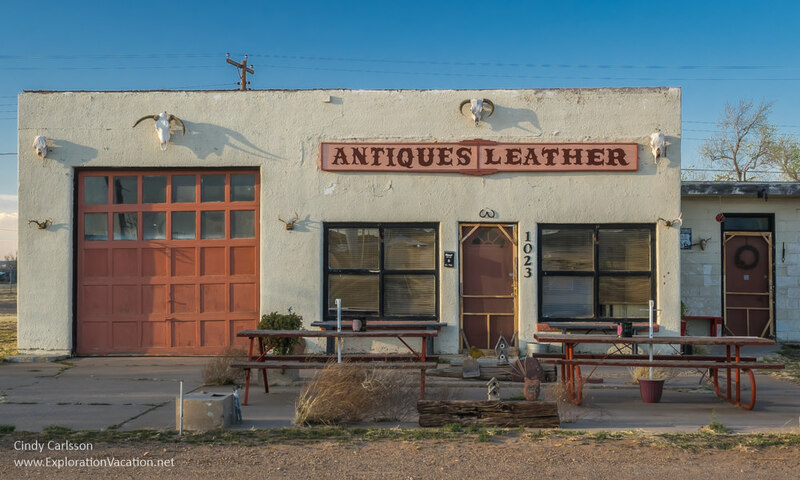 Whether you make it part of a longer journey on Route 66 or a day trip, Tucumcari is a good place to get a feel for the past along the historic roadway. Tucumcari is located in eastern New Mexico. It’s right along I-40 about 2 hours west of Amarillo, Texas, and 2 ½ hours east of Albuquerque, New Mexico. Today, historic Route 66 in Tucumcari is also signed as Business I-40. While it really seems like historic Route 66 should be explored by automobile, there are bus tours along the route. The Greyhound bus also stops in Tucumcari, but not along the historic Route 66 commercial strip. Near Tucumcari, Conchas Lake and Ute Lake state parks offer opportunities for outdoor recreation, including hiking and fishing. Dining was the one area where Tucumcari came up a little short. Not only are the options limited, but few places were open the day we visited. And even when they are open, most close pretty early in the evening, so have dinner before heading out to admire the neon. Like the hotels, national and regional restaurant chains are located near the freeway. But why eat at a place you have at home when you can eat along a Route 66 classic?! We didn’t eat at La Cita, Del’s, Golden Dragon, or Circa Espresso Bar (at the Historic Route 66 Hotel and the only remaining mid-century hotel coffee shop left in town) because none of them seemed to be open when we were looking for dinner. The same was true of Watson’s BBQ, located in the Tucumcari Ranch Supply building. I was looking forward to a good dinner with a bit of Route 66 kitsch when we arrived in town. The Pow Wow Restaurant and Lizard Lounge seemed like a place that could deliver. (And it was actually open.) Sadly, it was more of a dive than I expected and the whole experience was kind of weird and disappointing. Still, I’d be willing to give it a second chance. Kix on 66 looks like it could be a modern restaurant inspired by the golden era of mid-century road tripping, but it’s actually a 1960’s Denny’s that’s been updated and reimagined. Inside it is filled with Route 66-inspired art, much of it very contemporary in style. It’s a great place for salads, burgers, or (in my case) a hearty breakfast. Even if you aren’t particularly hungry, stop in for a snack and a chance to check out the art. Tucumcari is a great place to spend the night. While things were pretty quiet when we visited in March 2017, the Blue Swallow was fully booked. During warmer weather the old Route 66 strip fills up with automobiles and motorcycles of all vintages and rooms in the best classic motels sell out long in advance. While in town we stayed in a gorgeous room at the Roadrunner Lodge (TripAdvisor affiliate link). Amanda and David are still working their way through the full remodel, so there are fewer rooms available than you might expect. However, the ones they have available are absolutely wonderful. And, if you’ve been looking at those abandoned motels thinking how cool it would be to restore one, ask for some remodeling stories to inject a bit of reality into your fantasy. I’ve described the best and most interesting of the classics above. 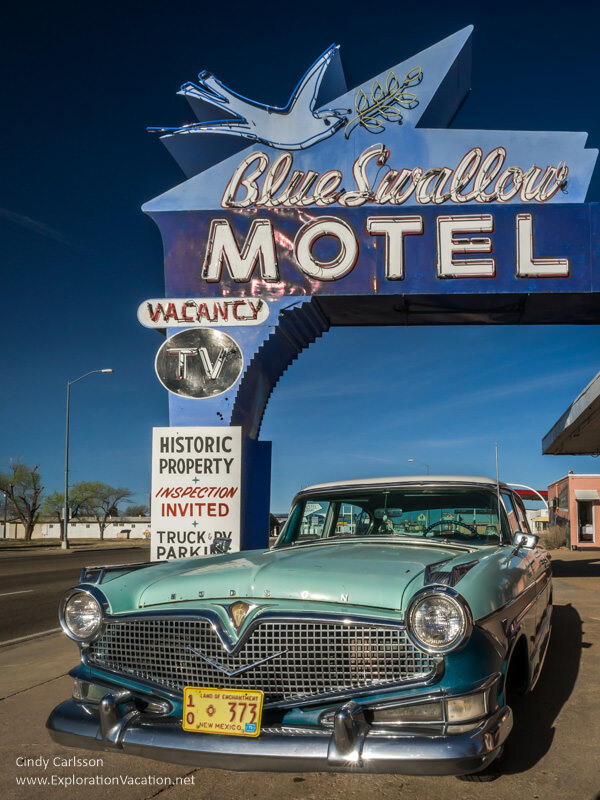 The Blue Swallow, Roadrunner, Safari, and the Historic Route 66 Hotel will all provide a good night’s sleep in distinctive and well-maintained surroundings. There are a number of other historic Route 66 motels still operating in Tucumcari. While some appear to be ok, none match the quality of these four meticulously restored beauties. However, most of the others are really inexpensive, so if you are on a tight budget, they are worth considering. Of course, there are also a few of the usual chain hotels in Tucumcari. The best of those aren’t nearly as cool as the better classic motels and will cost you a lot more. You can check reviews of all hotels in Tucumcari and even book a room at some of them using TripAdvisor. or Booking.com. There are lots of resources with information on Route 66. 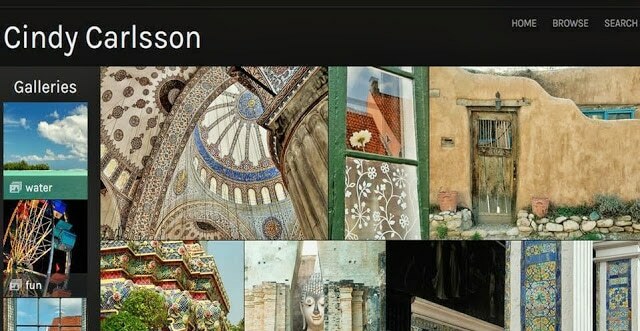 This list includes a few of the more useful or interesting websites I’ve found, but I’m sure there are many more. The National Park Service Route 66 Travel Itinerary has lots of information on Route 66 as part of its heritage travel program. Like its name suggests, Route 66 News covers news all along Route 66, including the renovation and demolition of historic buildings and signs, business openings and closings, and events. New Mexico Route 66 Association has great pictures, but most of them require Flash player to use. It also has some good links and, when up-to-date, good event info. 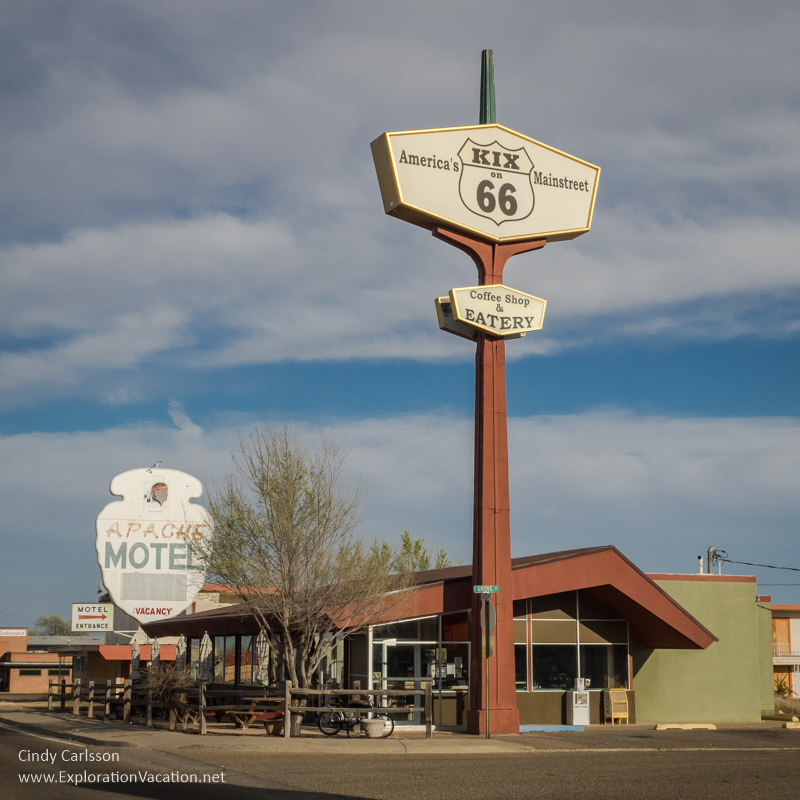 The Route 66 includes a building by building virtual tour of cities along the route, including Tucumcari. It also has a lot of trip planning information, although I’m not sure it has been updated recently. Roadside Architecture covers odd roadside signs, sculpture, and more throughout the USA, including historic signs along Route 66. I provide links as a convenience to you. Some of these may be affiliate links that pay me a small commission if you use them to reserve a room or purchase goods or services. You don’t pay anything extra, but it helps keep this website running. All affiliate links are for products or services I personally use and recommend. To learn more, review this website’s policies and disclosures.